Ransom pitcher Ryan Morajelo gets ready to throw a pitch in his five-inning, five strikeout performance. 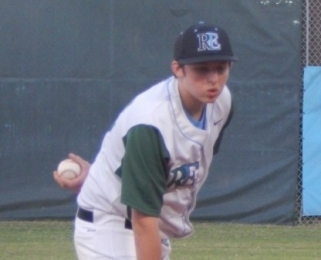 Ransom Raiders pitcher Ryan Morajelo received three runs of support in the first inning against the Miami Country Day Spartans Wednesday at the Boy’s & Girl’s Club of Miami-Dade. That was all he needed to win. Morajelo allowed just one run in five innings of work to lead Ransom to the 3-1 victory. Considering the Raiders won their first game on March 21st last season, Manager Kenny Perez sees the team has developed from then. Morajelo felt his off-speed stuff led him to have a quality start. “My change-up and curveball were really on today, and I was able to keep batters out in front and off-balance,” Morajelo said. The Raiders offense had a hot start with a bases loaded situation and no outs in the first. That’s when shortstop Danny Halula hit a bases-clearing double to obtain a 3-0 early edge. Chris Rossi, Mike McBrayer, and David Lanster all scored on the hit. In the second inning, Spartans junior Brian Macias recorded a sacrifice fly to right field to bring in sophomore Colton Katcher. That was the lone run Morajelo gave up the entire game. For the rest of the way, both starting pitchers took over the game. Morajelo did not allow another run while Spartans starter Juztin Gross retired 11 of the next 12 batters. In five innings, Gross allowed three runs and recorded six strikeouts. Freshman Jorden Gross pitched one inning to set up the seventh innings. Freshman Austin Pollak reached on an error in the seventh, which brought the potential tying run to the plate. Juztin Gross then crushed a ball to center field, where Sam Bolduc made a dazzling catch for the second out of the inning. His coach was pleased that Bolduc did not let his performance at the plate, affect his defense. 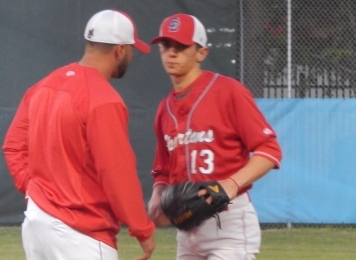 Miami Country Day pitcher Juztin Gross receives a mound visit. He bounced back from a rocky first inning and pitched a solid five innings. Despite not doing well offensively, Bolduc was determined to help his team win one way or another. After winning their first game of the season, the Spartans suffered three tough losses and allowed double-digit runs in each of those contests. This was the first close game the team played since the season-opening win versus Marathon. Manager Paul Barrios was happy to see his starting pitcher Gross battle back, but the team’s offense could not figure out Morajelo. Jack Archer shut the door the last two innings to seal the game and earn the save for the Raiders. Ransom returns to district play against Keys Gate Charter on February 24th, while Miami Country Day faces 3-0 Hialeah Educational on February 20th.